Your guests will not resist themselves from having a bite of this Tempting 1 Kg Eggless Pineapple Cake. 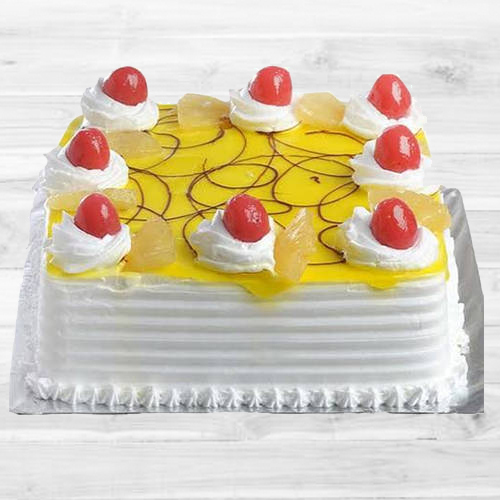 Everyone enjoys this Moist 1 Kg Eggless Vanilla Cake specially in a party or get-together.. Suitable for any occasion, serve your guests with this Glorious 2.2 Lbs Eggless Strawberry Cake. Make any cake cutting ceremony complete with this Surprising Eggless 1 Kg Black Forest Cake. Perfect for any celebration, this combo of Dazzling 12 Red Roses with 1 Kg Eggless Pineapple Cake will fetch you appraisal. This delicacy of Enjoyable 2.2 Lbs Eggless Plum Cake from Taj / 5 Star Bakery is suitable for birthday, anniversary and many more occasions.